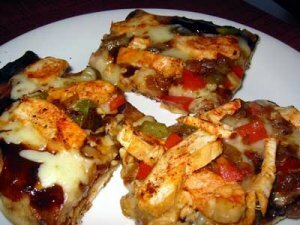 If you plan to go to a different country, expect to run in to some different and unusual foods and drinks that you normally would not even think to drink or eat here. I am sure that is what other say as well when they come to the USA and see some of the things that we have here. They would probably have the same reaction that we do. If you plan to go to Japan. There are some quite unusual things that they drink there as well. I will post a list up of some of the most unusual Japanese drinks. Pepsi ice cucumber. Now this does not sound like something that has a very tasty combination together. The Japanese seem to enjoy this quite unusual soft drink. Hot Calpis is a milk based drink with a yogurt taste to it. This unusual drink can be served hot and comes in a variety of fruit flavors. It is also a carbonated drink. 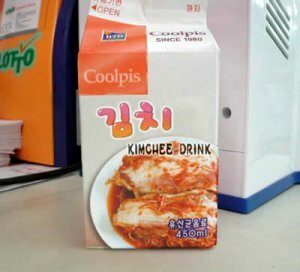 Coolpis is a peach or kimchee flavored drink. Kimchee is is a dish made from fermented cabbage and a lot of red peppers. Breast milk. Yes, I said breast milk. They sell breast milk by the carton. Black vinegar is a drink mixed with soy milk, blood orange juice or even blueberry juice. water salad is exactly what it sounds like water that tastes like salad. diet water is just as it is says, Diet water! How can you make water diet? Final fantasy potion is named after a video game called final fantasy. I am not sure what is in it though. Canned coffee. There is nothing wrong with the coffee itself just some of the names for them. There is BJ coffee, BM coffee, Depresso coffee, Black Boss coffee and God coffee. Kids beer this is not actually beer for kids, just named after the adult drink. It is almost like a coke or Pepsi drink, they just turned the bottles brown and put a label on it so it looks as though it is a grown up beverage. Bilk is 70%beer and 30%milk.YUCK. NEEDS is a cheese drink. It is a liquefied cheese drink that comes in plain, yuzu and berry. Pancake drink is said to be exactly what it is. It tastes like a cold liquefied pancake. Curry and Wahhabi ramune is a Japanese soda that is fruity. Pepsi white is Pepsi with a yogurt taste. This Japanese drink is made with cabbage and red peppers. It is a popular drink with many Japanese people. This are two different types of Japanese soft drinks. One of them is wasabi flavored which is a spicy Japanese condiment. The other drink is curry flavored which is generally an Indian spice. NEEDS is a cheese based drink that comes in three different flavors. This is one of the many cheese based drinks available in Japan. This is a drink that is suppose to taste like pancakes. It does a great job of doing so and you feel as if you are drinking cold pancakes. 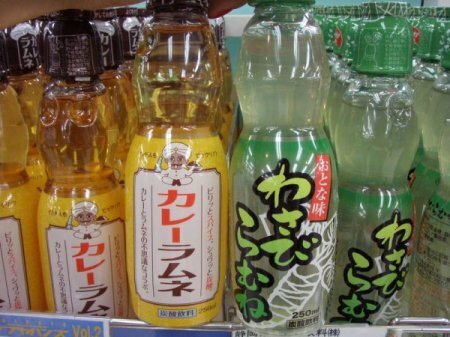 Share a link to a page on 15 Unusual Japanese Drinks and we will consider it for placement on this page.